If the Netflix series does 50% of this quality, give them an Emmy! Why? This book is so amazing. Forget the Batman works (which were excellent), this is Frank Miller at his best. After many battles with the Man Without Fear, the Kingpin finally learns the secret identity of Daredevil. He then systematically take steps to progressively destroy Matt Murdock’s life: ruins his reputation, has him disbarred, has his electricity disconnected (Ryan points out this wasn’t effective revenge enacted against a blind man), and finally blows his townhouse to smithereens. Out of the ashes, Daredevil is born again. This is a pure crime thriller that would have made a great second film in a DD trilogy (Thanks, Affleck!) Let’s hope it gets adapted in the TV series on Netflix. This is the story bible for a Hakwman movie! Why? If they ever make a Hawkman feature film, and it would be second only to Aquaman in awesomeness, this is the arc to adapt. Despite screwing up the “Hawkman was in early Post-crisis JL” stories, which I am sure tom Kelly has covered in articles here I lied and said I read, this is an amazing work of comics. It takes place entirely on Thanagar, covering Katar Hol’s transformation from spoiled rich brat to the hero we all know and love. This book reads more like a Vertigo story than one that sits in the DCU, proper. Gritty plot and art make it a hidden gem in the long boxes. George Perez might have actually invented the “How many people can fit in a phone booth” fad in the 1960s…. This is why we KNOW Avengers 3 & 4 will be epic! Why? I remember reading this when it came out and I thought, “I wish they could make a movie of this, but that will never happen because it is too big…” Screw you, 1990s Watson! You are a stupid moron who didn’t know about the MCU. You also should have learned to avoid carbs when you had a metabolism, but that is middle age Watson’s problem now. This arc is so amazing Kevin Feige even agreed to let the MCU be part of the Spider-Man soloverse just to make this an even MORE epic film (lunch bet!). What is rare about this mega-event is that it has a tight story that doesn’t require you to read a ton of mediocre crossover issues (where there even solo book tie-ins???) and ends with an epic battle that I pray we get in the TWO Avenger films likely to be based on this GN. The best parody of Hollywood since Get Shorty. Netflix should make this an animated movie. Why? Because I love Hollywood, self-contained stories, and humor. This short, autobiographical graphic novel tells of comic god Brian Michael Bendis’ efforts to get some of his early crime comics adapted into feature films. It is an outsider’s look at how movies get made, with Bendis breaking the fourth wall to let the reader in on the fun. It is simply hilarious. Why? Honestly, you have to read all of the original trades. It is one big, grand story told over several volumes (the beginning of the first trade is slow, but power through because it gets amazing!). However, the best of the bunch is Seasons of the Mist, so let that stand in for the whole run. I think this story should be made into a movie or a Broadway musical because you don’t get any bigger than the DEVIL HIMSELF getting bored being the Prince of Darkness and having an American Idol esque contest to see who gets the keys to Hell. This was every bit a grand arc, but at the same time it was a simple story of someone bored with their job and looking to do something different. Kinda like when I went back to business school… It is everything that is right with Sandman and Vertigo. Brilliant story. Why? This is quite simply the greatest Superman story ever written. Let’s see who wrote that….ok, what a surprise….it was Alan Moore. This is the Superman story DC commissioned Moore to write to end the Silver Age Superman series before the Post-Crisis reboot. It has a Silver Age feel, but having been written by Moore it has nuance and complexity unseen in most Silver Age stories. The story consists of Superman’s villains start becoming more violent and threatening (harkening to the post-Watchmen era that was dawning at the time), so he takes his loved ones and makes a final stand at the fortress of solitude. Though this story was only two issues (do they still make story arcs less than 6-8 issues? ), it took me a decade to find and read the second part (the back issues were rare and a collection didn’t come out for 10 years!) Worth the wait! This one is a little obscure. The best picture I can find on the web. Ah. That settles a true geek debate. “Bwah HaHa” DOES translate into any language! Why? Because comics can have humor; even superhero comics. 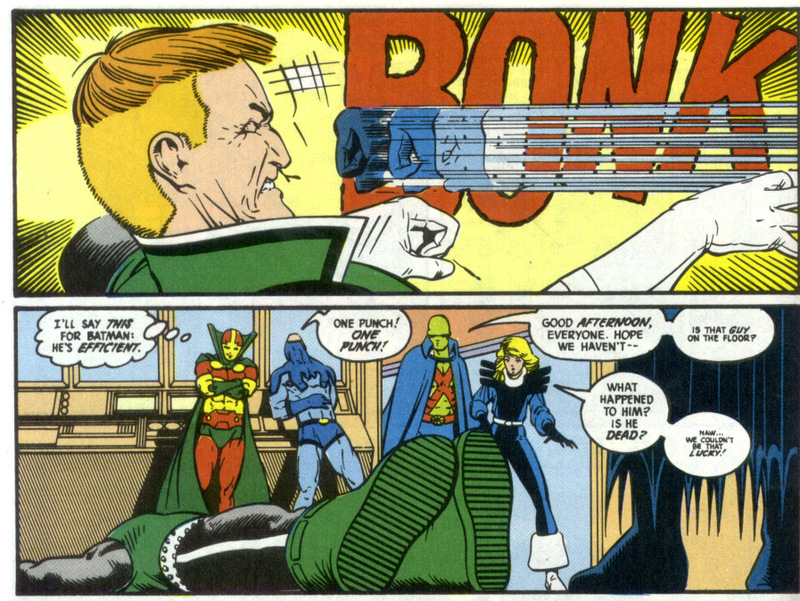 The Giffen era Justice League, especially Volume 1, really stood out in the late 80s because that was when the aforementioned Mr.Moore and Miller had introduced the gritty/realistic style that young Mr. Liefeld, McFarlane, et al. would later turn into Image. JL was a great book, with great art, and a sense of wonder that brought me back every month. The success lasted only a couple of years, and efforts to recapture it in later years didn’t really connect with me. 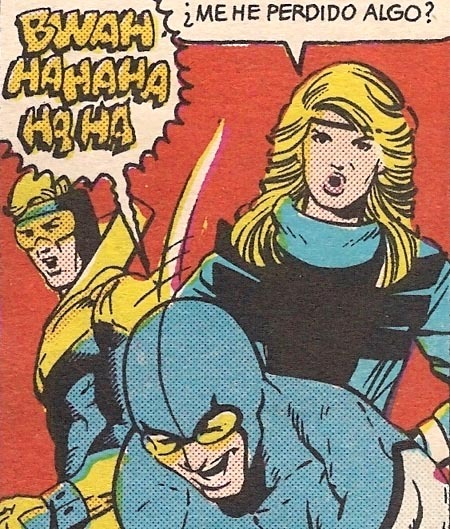 But every time I see the words Bwah-ha-ha typed out, I think fondly of my favorite era of comics, and that era was dominated by Justice League. Love your bit on 1990’s Watson, and your commentary on Sandman! Bone and Box Office Poison are the only comics my non-geek wife has read since we met back in 2009. Hawkworld wasn’t actually supposed to screw up the Silver Age Hawkman’s backstory. 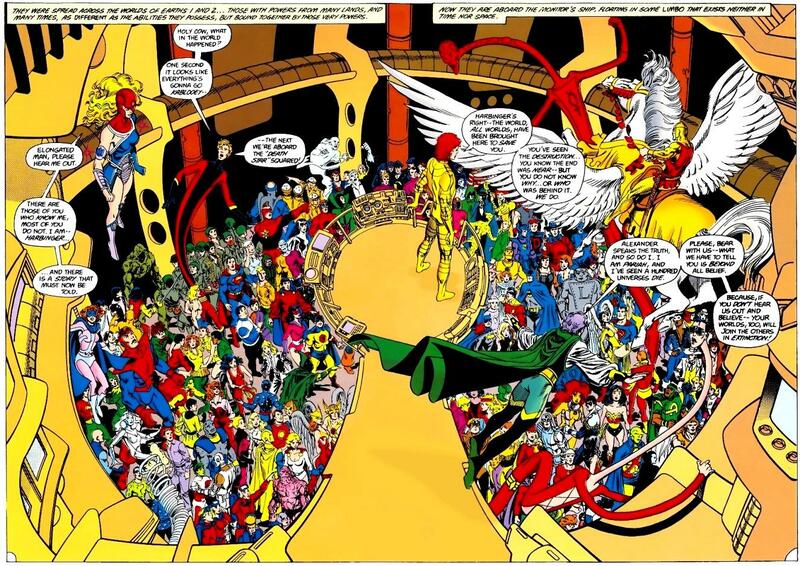 The mini was supposed to end with that Hawkman traveling to Earth and having his Silver Age adventures, but a later editor screwed it up and had him showing up after the formation of the League, so they had to retcon who the Hawkman on the JLA was (and it was the original from the 40s). Jimmy really should read the Giffen-era JLA stuff since he said something about going back to old stuff from DC instead of New Teen Titans. And there WERE Infinity Gauntlet crossover issues! Sleepwaliker had one! Peter David wrote a good one where a six-inch Hulk had to deal with a lovelorn, full-sized Abomination. Don’t feel I needed the IG tie-ins!